A bathroom remodel process that goes smoothly is an invaluable experience. But hiring multiple contractors to complete a bathroom makeover can all too often be a headache, especially when scheduling conflicts occur or when something goes wrong. Thankfully, for homeowners in and near Gilbert, Arizona, Premier Kitchen & Bath offers an alternative to this common scenario by providing comprehensive bathroom remodel services. When you choose us for your bathroom makeover, you’ll only deal with one company, from contract to completion. 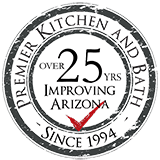 At Premier Kitchen & Bath, our staff includes certified designers, experienced project managers, and expert craftsmen. Given that our team has more than 150 years of collective design and remodeling experience, you can trust that your Gilbert, AZ, home will be in good hands when you choose us for your bathroom remodel. Our designers take the time to understand how you want your bathroom to look and function, then create several design concepts for you to choose from. They even select specific products and show you samples so you don’t have to spend your own time going through hundreds of remodeling products. With our vast array of remodeling skills, we can completely transform your bathroom from an outdated eyesore to an elegant retreat. And, should you decide to expand your renovation beyond a bathroom remodel, Premier Kitchen & Bath can renovate any room of your house – or even add a new one! If you’re ready to remodel your bathroom and bypass the typical stresses of renovation, contact Premier Kitchen & Bath today. We specialize in home remodeling in the Gilbert, Arizona, area, providing project design services, product selection, and construction management under one roof.